Name Variation Charles E. Moore was also known as John C.
Name Variation Charles E. Moore was also known as C. E.
Charles E. Moore married Mary Wagner. Charles E. Moore was born circa 1841 at New York. Name Variation Mary Wagner was also known as Anna. Mary Wagner married Charles E. Moore. Mary Wagner was born circa 1848 at Illinois. Name Variation Patrick McManigal was also known as McMonigal. Patrick McManigal was born at Pennsylvania. Patrick McManigal died before 1925. Married Name Her married name was McMonigal. Married Name Her married name was McManigal. Mary Small married Patrick McManigal. Mary Small was born circa 1868 at Pennsylvania. John Moore was born circa 1873 at Minnesota. Nellie Moore was born circa 1875 at Minnesota. She was the daughter of Charles E. Moore and Mary Wagner. M. L. Flinn married Emma Wilkens. M. L. Flinn was born circa 1850 at New York. He died between 1920 and 1925. Married Name Her married name was Flinn. Emma Wilkens married M. L. Flinn. Emma Wilkens was born circa 1859 at Iowa. Name Variation Noeline Flinn was also known as Noline. Name Variation Noeline Flinn was also known as Mary K.
Noeline Flinn was born circa 1916 at Iowa. She was the daughter of Edward B. Flinn and Lucile Moore. 1 January 1925 Sioux City, Woodbury, Iowa Noeline Flinn appeared on the census of 1 January 1925 in the household of Edward B. Flinn at Sioux City, Woodbury, Iowa. Lucile F. Flinn was born circa November 1918 at Iowa. 1 January 1925 Sioux City, Woodbury, Iowa Lucile F. Flinn appeared on the census of 1 January 1925 in the household of Edward B. Flinn at Sioux City, Woodbury, Iowa. Mathew L. Flinn was born circa December 1919 at Iowa. He was the son of Edward B. Flinn and Lucile Moore. 1 January 1925 Sioux City, Woodbury, Iowa Mathew L. Flinn appeared on the census of 1 January 1925 in the household of Edward B. Flinn at Sioux City, Woodbury, Iowa. Frank Flinn was born circa 1881 at Illinois. Name Variation Orville John McKenzie was also known as McKensie. 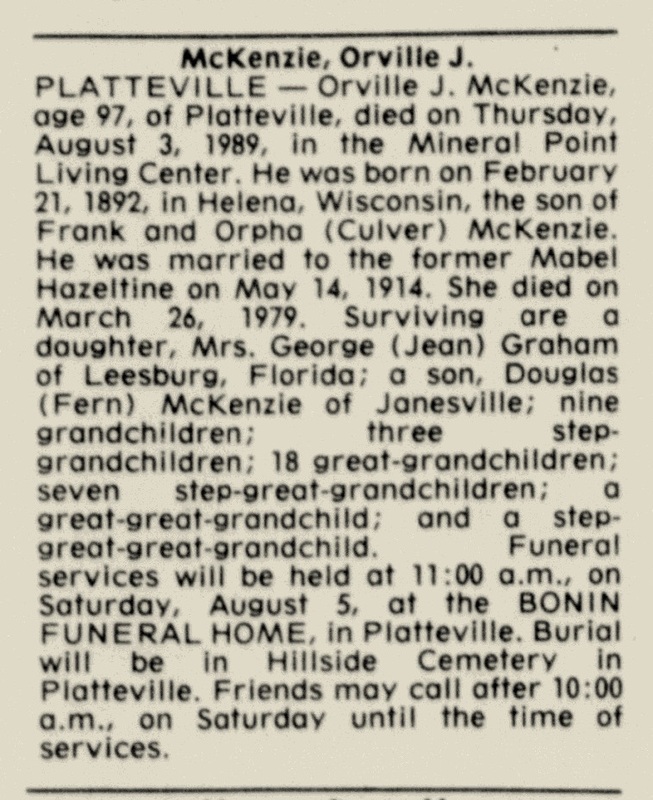 Orville John McKenzie was born on 21 February 1892 at Helena, Wisconsin. He was the son of John Frank McKensie and Orphia Jane Culver. Orville John McKenzie married Mabel Dorothy Hazeltine on 14 May 1914. 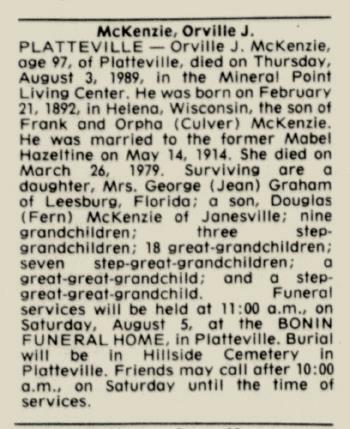 Orville John McKenzie died on 3 August 1989 at Wisconsin at age 97 Orville J McKenzie obituary; also reported as 03 Aug 1992. 1 June 1905 Spring Green, Sauk, Wisconsin Orville John McKenzie appeared on the census of 1 June 1905 in the household of William Hamby Seiders at Spring Green, Sauk, Wisconsin. [S245] U.S. Federal Census 1900 U.S. Federal Census, by Ancestry.com, ED145. Dwelling 51. [S244] U.S. Federal Census 1910 U.S. Federal Census, by Ancestry.com, Year: 1910; Census Place: Lone Rock, Richland, Wisconsin; Roll: T624_1732; Page: 5B; Enumeration District: 0089; FHL microfilm: 1375745. Name Variation Adelaide Elizabeth McKensie was also known as Addie. Adelaide Elizabeth McKensie married Benjamin Baxter Brown. Adelaide Elizabeth McKensie was born on 5 September 1894 at Wisconsin. She was the daughter of John Frank McKensie and Orphia Jane Culver. Adelaide Elizabeth McKensie died on 19 March 1978 at Sauk, Wisconsin, at age 83. She was buried after 19 March 1978 at Button Cemetery, Buena Vista, Richland, Wisconsin. 1 June 1905 Spring Green, Sauk, Wisconsin Adelaide Elizabeth McKensie appeared on the census of 1 June 1905 in the household of William Hamby Seiders at Spring Green, Sauk, Wisconsin. In July 1930 Mrs Joseph Seiders (Orphia Culver) visited Ben Brown home and new granddaughter. Name Variation Glen Keifer Chadsey was also known as Glenn. Glen Keifer Chadsey was born on 21 January 1888 at Sauk, Wisconsin. He was the son of Albert E. Chadsey and Cornelia E. Seiders. Glen Keifer Chadsey married Marie (?) circa 1925. Glen Keifer Chadsey witnessed the burial of Albert E. Chadsey in July 1931 at Eastlawn Cemetery, Beloit, Rock, Wisconsin. Glen Keifer Chadsey died on 22 January 1966 at Wisconsin at age 78. He was buried after 22 January 1966 at Wisconsin Veterans Memorial Cemetery, King, Waupaca, Wisconsin. [S245] U.S. Federal Census 1900 U.S. Federal Census, by Ancestry.com, Year: 1900; Census Place: Bashaw, Washburn, Wisconsin; Roll T623_1821; Page: 4B; Enumeration District: 165. [S250] U.S. Federal Census 1930 U.S. Federal Census, by Ancestry.com, Year: 1930; Census Place: Beloit, Rock, Wisconsin; Roll: 2609; Page: 14A; Enumeration District: 0008; Image: 862.0; FHL microfilm: 2342343. [S373] U.S. Federal Census 1940 U.S. Federal Census, by Ancestry.com, Year: 1940; Census Place: Beloit, Rock, Wisconsin; Roll: T627_4519; Page: 5A; Enumeration District: 53-11. Charlie Unbehaun was born on 30 May 1867. He was the son of Henry Theodor Unbehaun and Catharina Sophia Wacker. Charlie Unbehaun married Lillie Modena Baer, daughter of Henry Clay Baer and Elizabeth Matilda Schambaugh, on 28 January 1898. 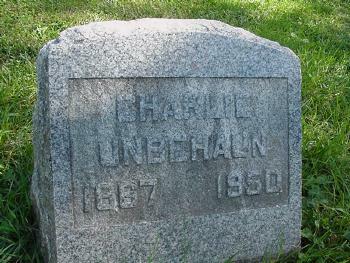 Charlie Unbehaun died on 6 December 1950 at age 83. He was buried after 6 December 1950 at Richland Center Cemetery, Richland, Richland, Wisconsin. J. S. Powers married Hattie Cass, daughter of Hiram Osman Cass and Harriet E. Hungerford, before 1898. Herman D. Jaquish was born in 1882. He was the son of Orlando R. Jaquish and Lucy S. Cass. 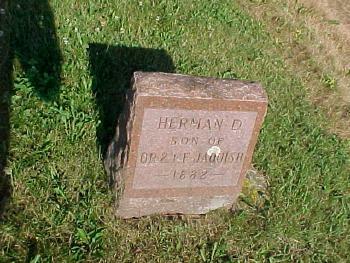 Herman D. Jaquish was buried in 1922 at Willow Valley Cemetery, Ithaca, Richland, Wisconsin. Name Variation Squire Howe was also known as S.
Squire Howe was born on 13 July 1800 at Vermont. He was the son of Squire Howe and Phebe Pierce. Squire Howe married Lucina Humphrey, daughter of Abel Humphrey and Deborah Riley, on 18 May 1826 at Hatley, Québec, Canada. 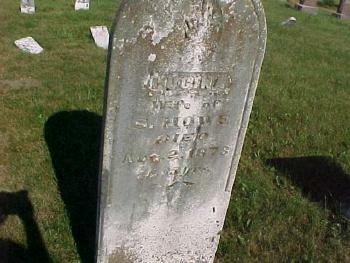 Squire Howe died on 19 January 1877 at Wisconsin at age 76. 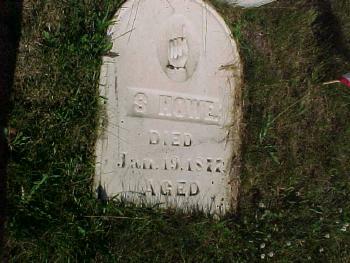 He was buried after 19 January 1877 at Willow Valley Cemetery, Ithaca, Richland, Wisconsin. Squire Howe immigrated in 1854. Married Name 18 May 1826 As of 18 May 1826,her married name was Howe. Lucina Humphrey was born on 19 April 1808 at Vermont also reported as 1807. She was the daughter of Abel Humphrey and Deborah Riley. Lucina Humphrey married Squire Howe, son of Squire Howe and Phebe Pierce, on 18 May 1826 at Hatley, Québec, Canada. Lucina Humphrey died on 2 August 1873 at age 65. She was buried after 2 August 1873 at Willow Valley Cemetery, Ithaca, Richland, Wisconsin. Alfred C. Marden was born circa 1850 at New Hampshire. He was the son of Jeremiah Gordon Marden and Nancy W. (?). Byron M. Marden was born circa 1852 at New Hampshire. Charles F. Marden was born circa 1855 at New Hampshire. Alice E. Marden was born circa 1861 at Wisconsin. She was the daughter of Jeremiah Gordon Marden and Nancy W. (?). Henry Marden was born circa 1842 at New Hampshire. Carrie E. Poole was born circa 1865 at Wisconsin. She was the daughter of William S. Poole and Lucina B. Davis. 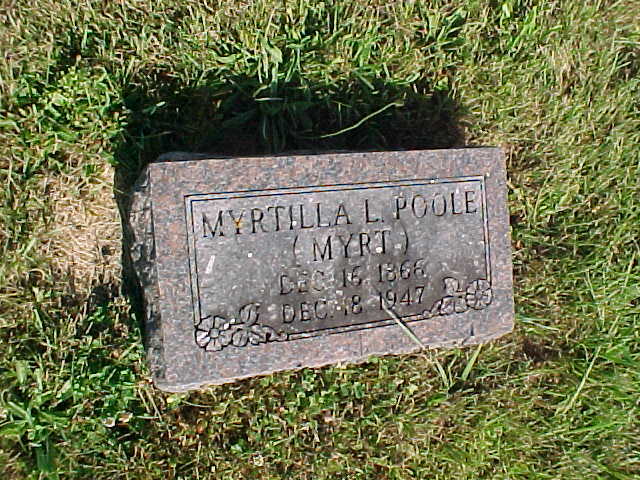 Name Variation Myrtilla L. Poole was also known as Myrt. Name Variation Myrtilla L. Poole was also known as Myrtie E.
Myrtilla L. Poole was born on 16 December 1866 at Wisconsin. As of 1947, Myrtilla L. Poole was never married. She died on 18 December 1947 at age 81. She was buried after 18 December 1947 at Willow Valley Cemetery, Ithaca, Richland, Wisconsin. Wilbur W. Poole was born circa 1870 at Wisconsin. He was the son of William S. Poole and Lucina B. Davis. Elma M. Poole was born circa 1874 at Wisconsin. David Henry Jaquish married Hannah Worden.